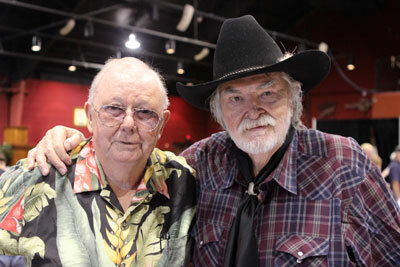 Photos from “A Gathering of Guns 5—A TV Western Reunion” at the Memphis Film Festival, co-sponsored by WESTERN CLIPPINGS, June 13-June 15, 2013, at Sam's Town Hotel and Casino in Tunica, Mississippi. 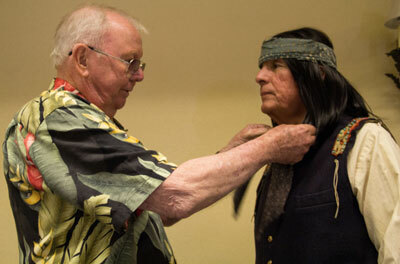 Costumer Luster Bayless readies Rudy Ramos (Wind on “High Chaparral”) for his marvelous presentation as Geronimo following a panel discussion. 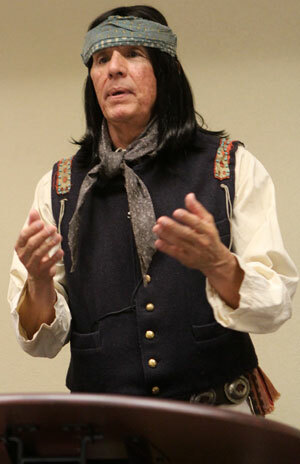 You could hear a pin drop in the audience as Rudy Ramos portrayed Geronimo. 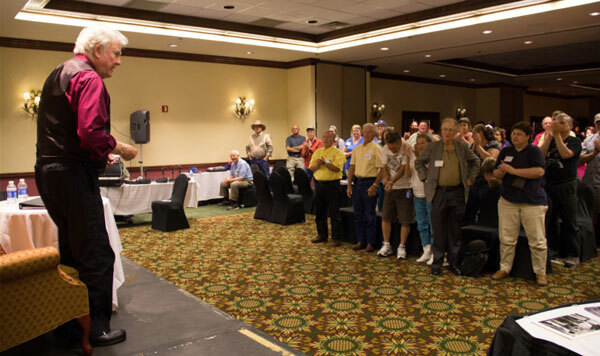 The audience, including Tim Considine (right), gave a standing ovation after Rudy’s performance as Geronimo. 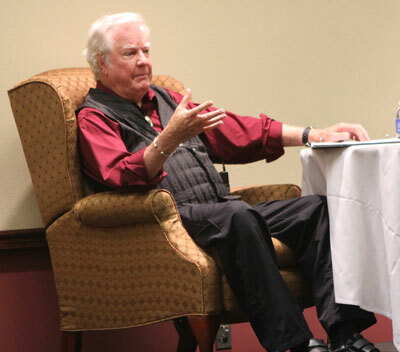 James Best delighted the full house Friday night audience with his stories and recollections of his fabulous career. 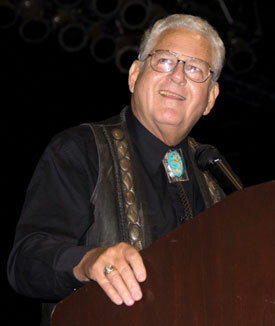 He incorporated film clips from many of his movies and TV shows. 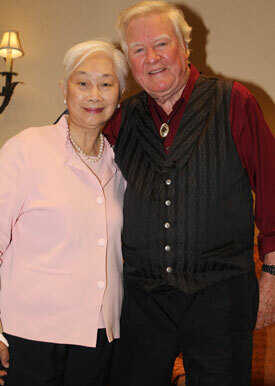 James Best takes a bow to the audience’s standing ovation. 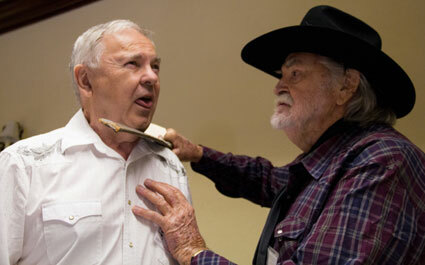 Gregg Palmer “threatens” Boyd Magers with the original machete Gregg meanced Ethan Wayne with in “Big Jake”. Magers obtained the machete from Palmer several years ago. 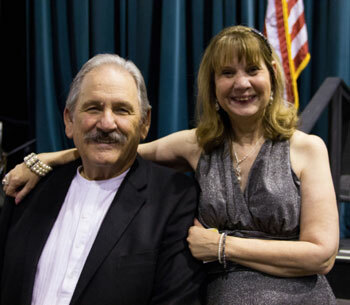 The festival’s Carol Ann Kellum was an enormous help to Gregg Palmer at “A Gathering of Guns” following Gregg’s recent knee surgery. 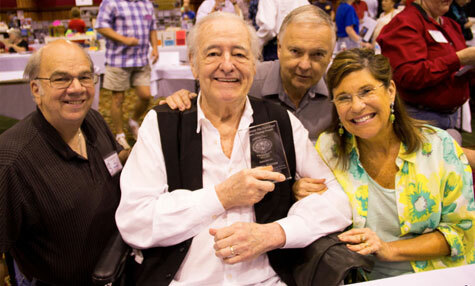 Manolito...“High Chaparral”’s Henry Darrow receives his award from festival co-sponsors Ray Nielsen and Boyd Magers. Henry’s wife Lauren is beside him. 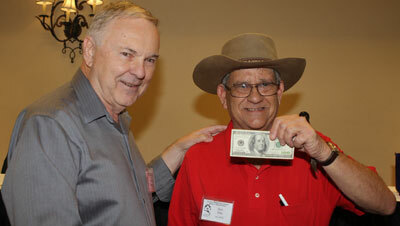 Don Ellis of Birmingham, AL, was the winner of the annual trivia contest and receives $100 from festival co-sponsor Boyd Magers. 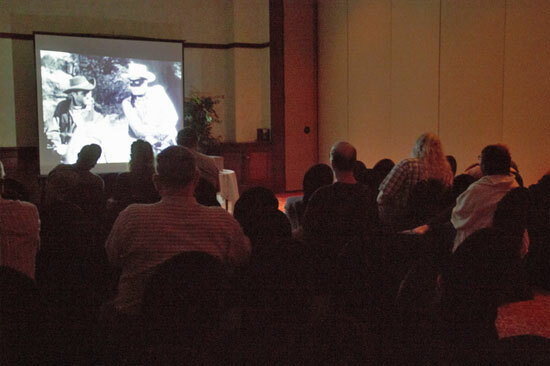 The film room was packed when episodes of the real “Lone Ranger” were screened. 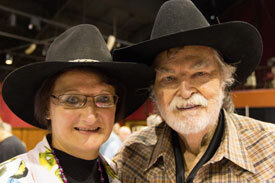 The Father’s Day weekend was a perfect time for Clayton Moore’s daughter Dawn to reminisce about her father. 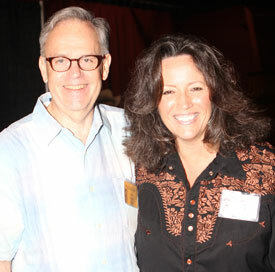 Remembering “The Lone Ranger”...radio Lone Ranger Brace Beemer’s grandson Bob Daniel with Clayton Moore’s daughter Dawn. Havin’ fun at the Saturday night banquet! 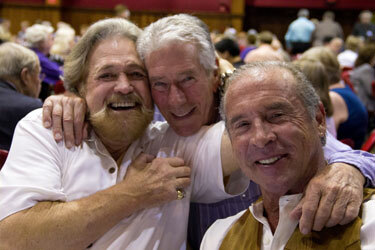 Dan Haggerty, Bob Fuller and Don Shanks. 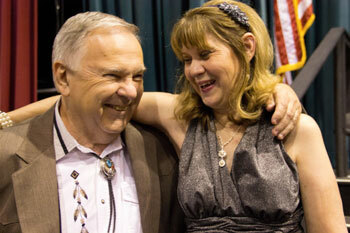 A great meal provided by Sam’s Town and a great time at the Saturday night banquet for some 400 people. 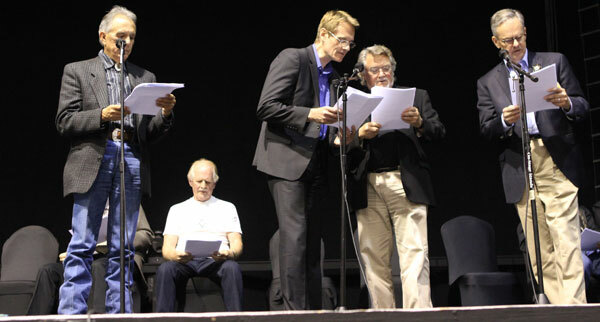 Recreating a “Lone Ranger” radio show at the Saturday night banquet are (L-R) Rudy Ramos, David Stollery, Duncan Regehr as Butch Cavendish, Tim Considine and Bob Daniel (Brace Beemer’s grandson) as The Lone Ranger. 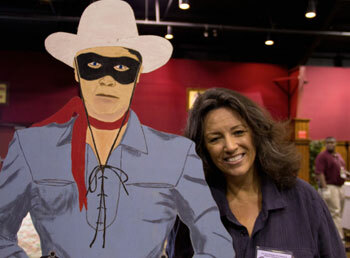 Let’s hear it for the stellar cast of the “Lone Ranger” radio show recreation as directed by Gary Yoggy. 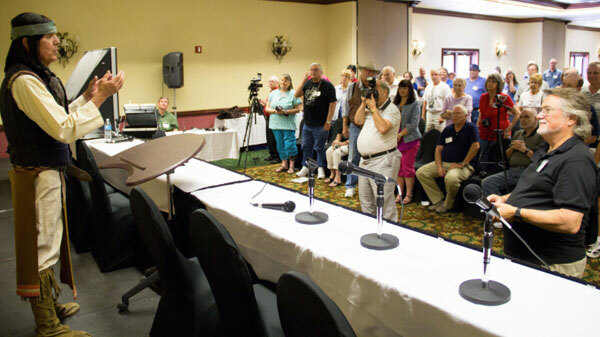 (L-R) Rudy Ramos, Duncan Regehr, Tommy Nolan, David Stollery, Tim Considine, Bob Daniel, Boyd Magers, John Buttram and Don Collier. 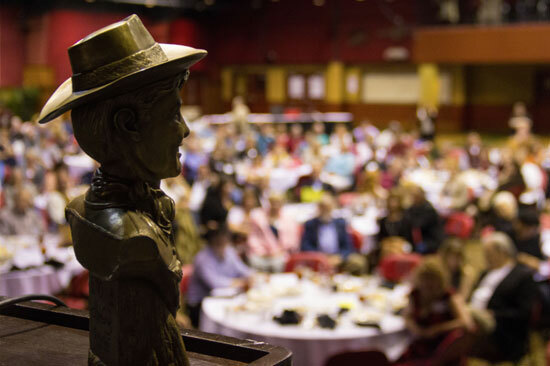 A solid resin-bonded bronze bust of Will “Sugarfoot” Hutchins by artist Russ Sacco was auctioned off at the Saturday night banquet for $200. 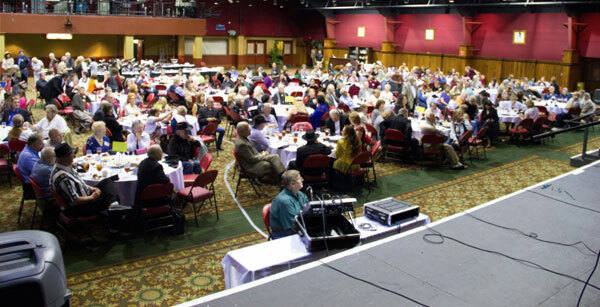 Johnny Crawford entertained at the Saturday night banquet performing ‘20s and ‘30s tunes along with his unique brand of comedy. 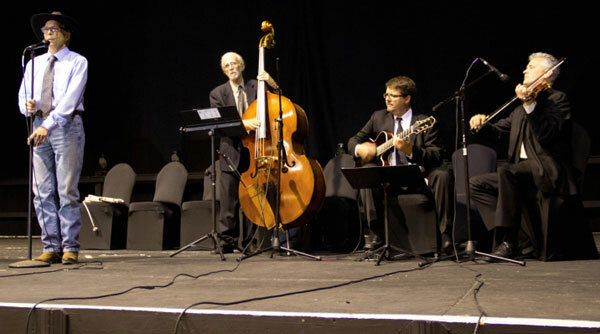 Looking forward to 2014, festival co-sponsors Boyd Magers and Bonnie Boyd (above) and Packy Smith and Bonnie Boyd (below).